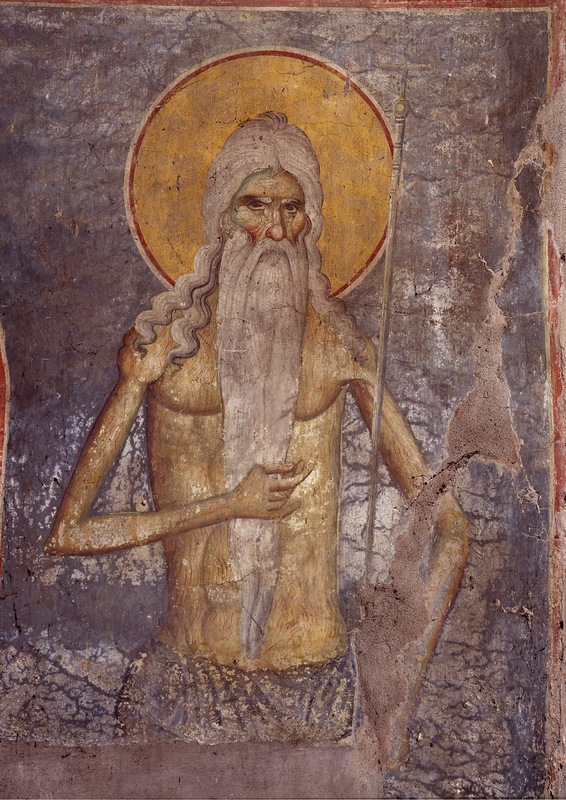 On this day we commemorate our Venerable and God-bearing Father Peter who lived in asceticism on the Holy Mountain of Athos. Saved naked from the sea of life. Our renowned Father Peter, had Constantinople as his homeland, and his noble and glorious parents held to the fear of God in their household. Thus the great and wondrous Peter showed forth this good fruit, which sprouted forth from them. His parents sought to have their beloved son educated in every form of divine and human wisdom, and later he was honored with the imperial office known as Scholarios. The emperor of the Romans at that time, admiring the extraordinary bravery of the Saint, made him, against his will, first over the military orders. He was then sent by him to fight against the Hagarenes, who at that time seized and enslaved areas belonging to the Romans. When Peter went to battle, he was defeated and captured by the Hagarenes, according to the unspeakable judgement of God, and he was shut in a dark and dirty prison cell bound by iron. When the wondrous one despaired of any salvation from men, he completely gave himself to intense prayer to God, and he supplicated the great and wondrous Nicholas, whom he greatly reverenced since a young child, and he promised that if he was freed from his bonds and prison, then he would immediately abandon the world and all worldly things, and he would become a monk, as he had initially promised God to do. 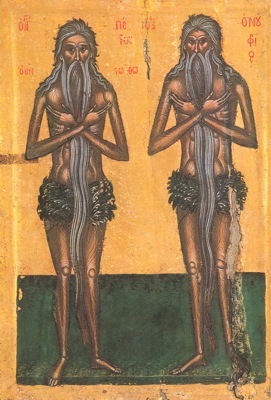 Wherefore Nicholas, the servant and imitator of the philanthropic God, did not overlook the faith and tears of the Saint, but he appeared in his dreams together with Saint Symeon the God-Receiver, and together they unbound Peter from those heavy and indestructible bonds, and they advised him to go to Old Rome. When the Saint arrived there, he cut the hairs of his head, and put on the monastic schema. Then entering a boat, he departed Rome. Guided therefore by divine revelation, he arrived at the southern edge of the mountain of Athos, which at that time was not inhabited by monks, and was completely uninhabited. 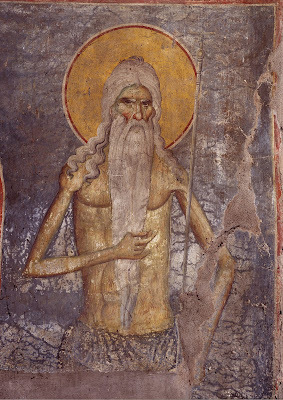 There he found a cave, and the blessed one quietly settled there, feeding off wild herbs, and completely naked, because over the course of many years his clothing completely dissolved. He was covered only by the hairs of his head and beard, and girded with the leaves of herbs. After bravely enduring many battles and various temptations from demons, the renowned one was made worthy of divine visions, and to be fed with angelic bread, called manna, which was essentially completely unrecognizable by people. 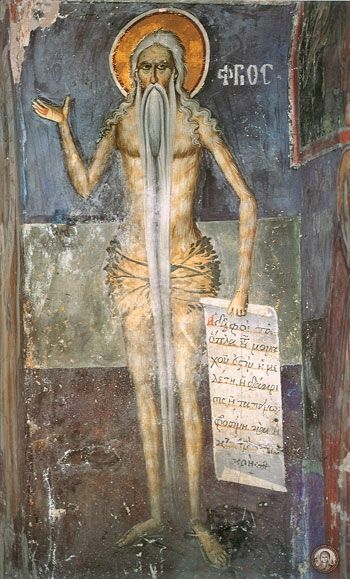 With such a super human and angelic life, the thrice-blessed one passed fifty-three entire years, then he departed to Christ whom he longed for. His virtuous actions were revealed by God completely to a hunter, as his longer biography narrates. This account was written in Greek by the divine Gregory of Thessaloniki who is also called Palamas. In the flesh you lived the life of Angels, you were citizens of the desert and treasuries of grace, O Onouphrios adornment of Egypt, and Peter the light of Athos. Wherefore we honour your struggles as we sing to you: Glory to Him Who has strengthened you; glory to Him Who has made you wonderful; glory to Him Who through you works healings for all. By your achievements in the wilderness you became like the Bodiless Powers, godly Onouphrios, and venerable Peter adornment of Athos, you heavenly-minded pair who sing: Alleluia.